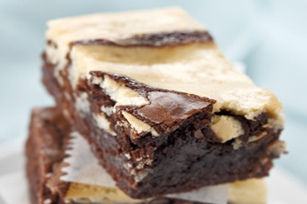 As one fan noted in a review, these PHILADELPHIA Marble Brownies are the best way to have both a brownie and cheesecake simultaneously. Beat cream cheese in medium bowl with mixer until creamy. Add sugar, egg and vanilla; mix well. Drop by tablespoonfuls over brownie batter; swirl with knife. Use small round cookie cutter, about 1 inch in diameter, to cut cooled brownies. Sprinkle 1/2 cup Baker's Semi-Sweet Chocolate Chips over swirled brownie batter before baking as directed.